While some people look at their bathrooms as yet another step in getting out the door in the morning, others look at their washroom as a sanctuary away from the hassles of everyday life. If you're the kind of person who loves a good soak in the bathtub on the weekends, there are a few bathroom accessories that can turn it into an even more enjoyable experience. Having a towel rack close by after you've finished a long bath is a luxurious option that is quite easy to install. You can place a few hooks outside of your tub that will put them within reach or a rotating rack that can hold multiple towels and swivel over when needed. If you're installing a new bathroom vanity into your washroom, consider setting aside some counter space for an iPod dock. Now you can listen to your favorite tunes whether you're taking a shower in the morning or taking a relaxing bath. Go for a simple black design that can blend easily with your soap dishes, vessel sink and other style choices. Improving the comfort level of your bathroom should be one of the finishing touches of your project that pulls it all together. 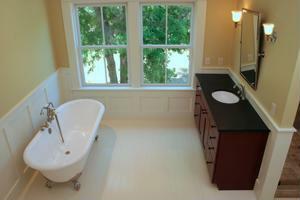 What additions do you suggest for homeowners looking to make their bathroom versatile and cozy?